The Black Lives Matter activist was filming on Periscope when he was wrestled down by an officer. 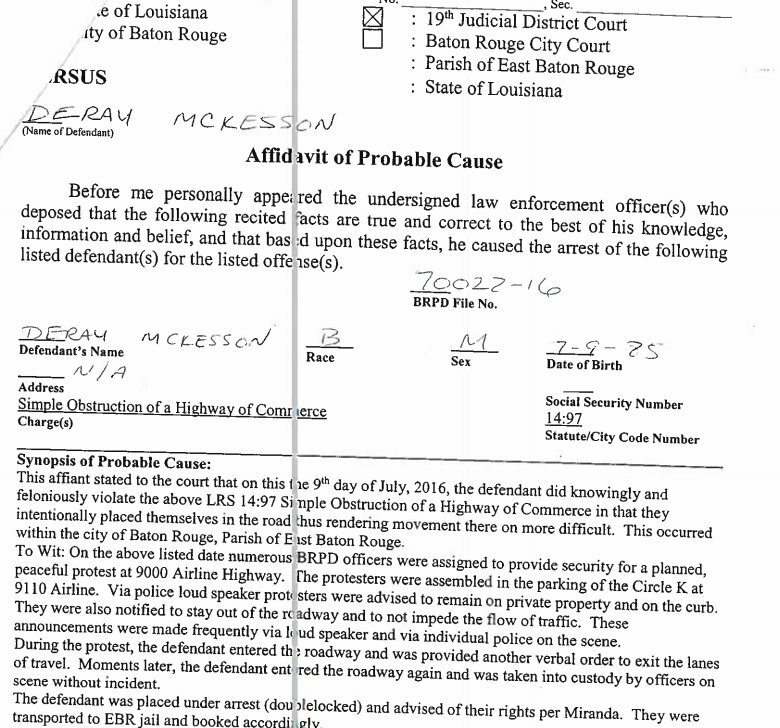 NBC News reports BLM activist DeRay Mckesson was released from East Baton Rouge Parish Jail on Sunday afternoon, according to facility records. Mckesson, along with over 100 other protesters, was arrested in Baton Rouge on Saturday evening for demonstrating against the police shooting death of Alton Sterling. Protesters yelled, “No justice, no peace!” as they assembled in front of the Baton Rouge Police Department on Saturday and Sunday, urging for the release of Mckesson and others. Walking outside of the jail after his release, Mckesson said, “I remain disappointed in the Baton Rouge police who continue to provoke protesters who were peacefully protesting,” and that “the only people who were violent last night were the Baton Rouge Police Department. The protesters remained peaceful both here and across the country.” He also asked the DOJ to intervene in the investigation of Sterling’s death and to survey the treatment of protesters. Activist DeRay Mckesson, one of the most prominent voices in the Black Lives Matter movement, was arrested around 11:15 p.m. late Saturday evening while protesting the police shooting death of Alton Sterling in Baton Rouge, ABC News reports. Officers have formally charged him with “simple obstruction of a highway of commerce,” according to the below tweet by New York Times reporter, Yamiche Alcindor. Mckesson was one of 200 people arrested during protests on Saturday night, The Washington Post reports. Protests broke out across the nation in New York, Atlanta, Oakland and in Minnesota where another black man, Philando Castile was shot and killed by an officer, days after Sterling’s last minutes went viral. A video filmed by Mckesson on Periscope, a social media streaming service, floated all over Twitter and Facebook on Saturday night. As he walks the road, detailing immense police presence, he makes note that the road has no definitive sidewalk. Yet and still, Mckesson and other protesters are repeatedly asked by officers to steer clear of the road and to remain behind the road’s white line. “Watch the police, they are just literally provoking people,” Mckesson says. About five minutes into the stream, the video abruptly shakes as you can hear an officer take McKesson into custody. His fellow protesters take his phone to record as they continue marching, demanding answers for his arrest. Friend and fellow activist Brittany Packnett told The New York Times that she was dumbfounded. “They told him they would arrest him if he stepped over the line, and like every single eye-witness and the video prove that he never stepped over that line,” she said. In her interview she says she last spoke with Mckesson around 5:15 on Sunday morning and that he was “physically ok,” and alluded to the fact that he would be charged, which as of Sunday morning, was confirmed. According to The Times, The Louisiana National Lawyers Guild is providing legal support to protestors and Mckesson, and set up an online fundraiser to post bail. Journalist Maya Lau interviewed a Louisiana State Police officer, questioning him about the police presence and their tactics during what seemed like a peaceful protest. He says that officers are there to protect and welcome the protests as long as they remain peaceful. He also says that the protesters were obstructing traffic, which caused the police to get involved. Many keep refuting the claim that Mckesson and other protesters were violating instructions by crossing the white line. Mckesson represents a voice for young Black Americans who feel disenfranchised, first gaining recognition for his criticism over police and their handling of Michael Brown’s shooting death in Ferguson. Since 2014, he has risen as a visual representation of the Black Lives Matter Movement, known for wearing a blue vest and red sneakers as he marches for justice. Bold and unapologetic, the below tweet is pinned to the top of his twitter profile, a stark reminder to his critics that he will continue the fight. As of Sunday morning, the hashtag #FreeDeRay is the number one trending topic on twitter. A slew of actors, writers and activists have voiced their support of McKesson. Keep tuning into NewsOne for more updates on Mckesson’s arrest.